Every year, companies question if advertising on the Super Bowl is worth the $4.5 million it cost in 2015. A brief article in Ad Age highlighted the winners based on purchase consideration boost, word-of-mouth boost, growth in Facebook fans, and growth in Twitter Followers. This blog post examines the second category – word-of-mouth boost. Word-of-mouth is measured through social media buzz, which is covered in Chapter 9 of the text. The concept of word-of-mouth is also covered in Chapter 10. GoDaddy – this ad is the entrepreneur ad that did appear on the Super Bowl. The company’s word-of-mouth surged to 9.2 from 2.2, over a 300% increase. GoDaddy Lost Puppy Ad– this ad was launched prior to the Super Bowl and was pulled because of backlash. Which of the first three Super Bowls ads did you like the best? Why? Examine the Super Bowl of GoDaddy’s (Lost Puppy) that was pulled prior to the Super Bowl. This ad generated a considerably amount of negative buzz because it seemed to be about puppy mills. As a result GoDaddy pulled the ad. Do you think pulling this ad had any impact on the surge in word-of-mouth buzz generated by the entrepreneur ad they did have in the Super Bowl? Why or why not? Explain why you think each of the ads generated a high word-of-mouth buzz score. Be specific. How important is generating word-of-mouth buzz with a Super Bowl ad? Why? With GoDaddy, each year the company creates two ads. One is rejected, the other is accepted. Many critics believe GoDaddy does this on purpose to generate buzz knowing people will go to the Internet to see the rejected ad. Do you think the lost puppy ad was done on purpose, to drive buzz for GoDaddy? Why or why not? 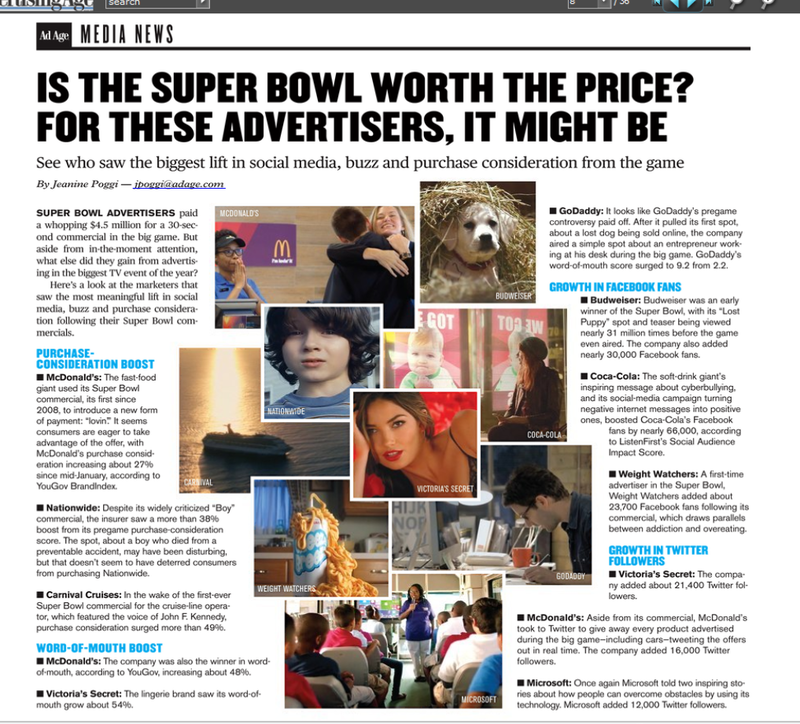 Here is an image of the Ad Age article from February 9, 2015. Posted by Dr. Donald Baack on February 24, 2015 in Chapter 07, Chapter 09, Chapter 10 and tagged Buzz, GoDaddy, McDonald's, Super Bowl, Victoria's Secret, Word-of-mouth.